Amazing ocean and city views from this lower floor, direct ocean front residence. Spectacular decor, a true gem! 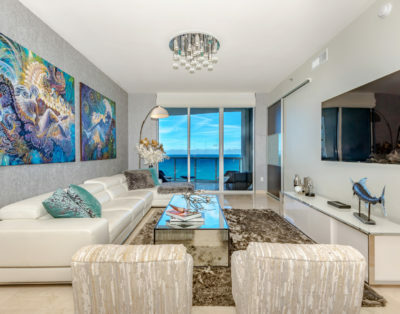 The unit features a split floor plan with ocean views from every room, even the kitchen! Private wraparound balcony with access from the living room, master bedroom and also the second bedroom. The kitchen offers stainless steel appliances, granite countertops, and is fully equipped for all your cooking needs with utensils, plates, and glasses. There are marble floors throughout the entire apartment. Master bathroom features a shower and also a large tub. Walk in closets with custom shelving for all your storage needs. Two week minimum stay. Monthly rates available! Valet parking is a one time charge of $10 for your entire stay. Self parking is available at an additional cost (inquire about availability and pricing when booking). High chair and baby crib are also available at an additional cost and can be reserved for your arrival (inquire about availability and pricing when booking). Rate Includes all utilities including wifi, cable TV (3 TVs), and beach service. Great location with everything in walking distance. Local restaurants and stores are all conveniently located in the surrounding area. Building features top of the line amenities: oceanfront exercise room & pool, club room with pool tables and flat screen tvs. The city of sunny isles pier and restaurant is located directly adjacent to la perla and connects to the building’s pool deck. South beach is only 11 miles south (25 mins) of Sunny Isles down collins avenue and Fort Lauderdale beach is is the same time traveling north. The Hard Rock casino is only a 20 min drive as well. Optional Services: Daily/weekly cleaning available at additional cost. Cancellation: No cancelation once reservation is made.